Camaraderie, a motorcycle IED and the tragedy in Tucson. It’s Thursday afternoon. 1:15, according to the clock on the wall. <when I started this post; stopped and started a few times.> There are four of them. One lists Qatar (11:45) one lists Zulu (8:45) and one lists Fort Bragg, NC. It’s 3:45 a.m. back there. The guys I work with and for are all stationed back in NC, so that clock makes sense. Funny. Afghanistan is a third world, land locked country and they have their own time zone. Literally. We’re 12 hours and 30 minutes ahead of California. That’s what I know for sure… Boop. I mention the clocks because I spend 11-14 hours a day at my desk. There are four clocks are on the wall in front of me-and I still have to do the math to figure out what time it is in California, Washington DC or Kentucky. Enough about me, let’s talk about… me for a while. OK, not me, per say. But the week here. I got to speak with two of my friends who’re south of Kabul in the area of the country commanded (being dealt with) by the Marine Corps. It’s been referred to as Marineistan. <Gram, if you click here to see the story you’ll have to click the BACK arrow at the top of the screen to go back to my blog> It was great to hear them laugh especially since I hear the reports and I know how busy they are down there. One of them’d just finished participating in a serious offensive operation and, calling from his office back on his Forward Operating Base, shared an anecdote from the week. It was only kind of funny (to me) but listening to him laugh until he had trouble speaking was contagious. I’ve seen more football in 10 days than I have in the past five years. As you may or may not know, I’ve got little to no appreciation for the world of professional sports… save for hockey. Gram and Eric are rabid basketball fans and I only pay attention so as to not make the mistake of calling either one during a Lakers game. <gasp!> If I do have a team, it’s the KC Chiefs. That’s a long story, though, not for this post. I arrived here when the college football season was in full swing. One of the TVs was ALWAYS on a football game, regardless of the time of day. The Armed Forces network replays some of the games (college or pro) and most of the Task Force is willing to forgo sleep catch a live game. Works well since ESPN is also one of the channels we subscribe to. That brings me to Tuesday morning. I showed up at work for the last 30 minutes of the Auburn/Oregon game. (we’d all worked late the night before because the commander authorized a late start FOR THE PURPOSE OF LETTING THE GUYS WATCH THE GAME.) I should clarify, I showed up and there were 30 minutes left in the game; I didn’t plan it that way. War Eagles vs. Ducks. Even I was excited as the Ducks scored a touchdown and then got a two point conversion to tie the game at 19 with less than three minutes on the clock. (the TV is huge and on the wall next to the clocks… hard to miss.) The excitement was palpable. 99.6 percent of the people here are Auburn fans. The lone Ducks fan is the youngest kid on the task force, the most junior in rank… and the only red head. They call him Ginger. Poor dude reported for duty Wednesday morning wearing a bright orange, long sleeved Auburn t-shirt. It’s his penance. You see, the Ducks managed to tie the game but Auburn went on to win. He’s taking it well despite the horrible way his sergeant’s shirt clashes with his hair and beard. 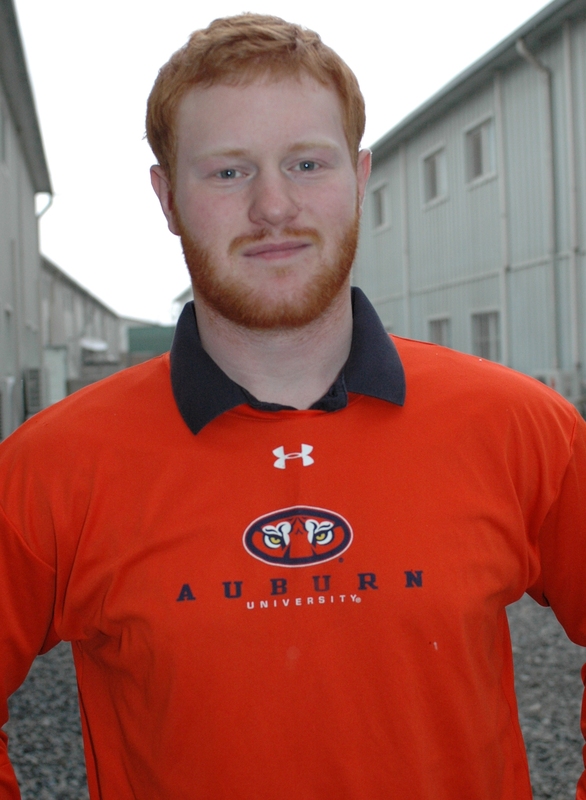 He's a good sport and has been wearing Auburn orange over a collared shirt all week as per the details of the bet. Makes me think of my Marines in California and the ways they harrassed each other. Make no mistake, though. GINGER IS A DUCKS FAN. It’s a tangible example of the camaraderie here, the way these guys get to know everything about each other. They’re a family, which is good because there’s no reprieve. They share living spaces, exercise together, eat together, work together the same 10-14 hours a day and yet still they find time to have fun. It makes me miss my Marines in California. There was a suicide attack here in Kabul City. You can read about it here. It’s a stark reminder there are men doing everything in their power to ensure GIRoA (Government of the Islamic Republic of Afghanistan) doesn’t succeed. A whole element of people (many from Afghanistan and many more who travel here to partake in a cause they’ve been brainwashed to believe in) don’t want to see Afghanistan standing on it’s feet, free of corruption. They don’t want the people educated and thriving—without being a hot bed for terrorists prepared to travel the world to attack democracy. All of that to say… there is a war going on here. Sad then, to think I’m safer here at Green Village than a bunch of Americans were at a Safeway in Tucson, Arizona this week. I watched President Obama’s speech from the memorial service at my desk this morning and, like I have several times while reading news accounts of the horror and it’s aftermath, I cried. The entirety of his speech is available here. If you missed it, take 35 minutes and catch up. He quoted scripture in the appropriate context, made reference to God and heaven and spoke of prayer bringing us together. He condemned evil and placed the blame squarely on the shooter–all the while refusing to use his name. Wherever you are reading this, I hope you’re safe, making an impact and, in your own way, making sure our country lives up to her expectations. I loved this post. Don’t be offended that it took this long for me to read it. But I loved how funny and sad it was at the same time – and how I can literally see you doing that crying/gaspy thing. Okay so I found the blog again and promise not to lose it. Thanks for finding the good. Camaraderie beats war; compassion beats evil and Jennie learns to appreciate football! Keep posting!